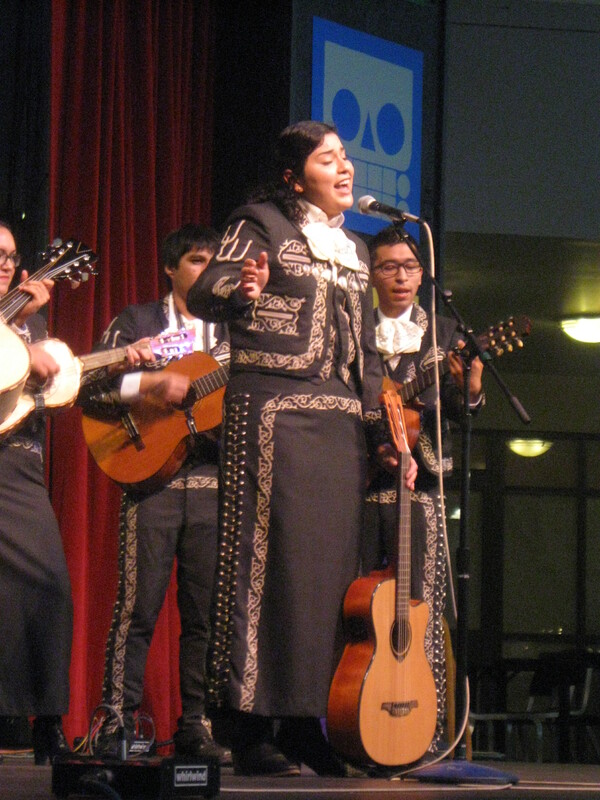 This beautiful young woman sings with Mariachi Quinto Sol, from Seattle’s University of Washington, as they welcome you to Day Two of our big Dia de los Muertos festival. 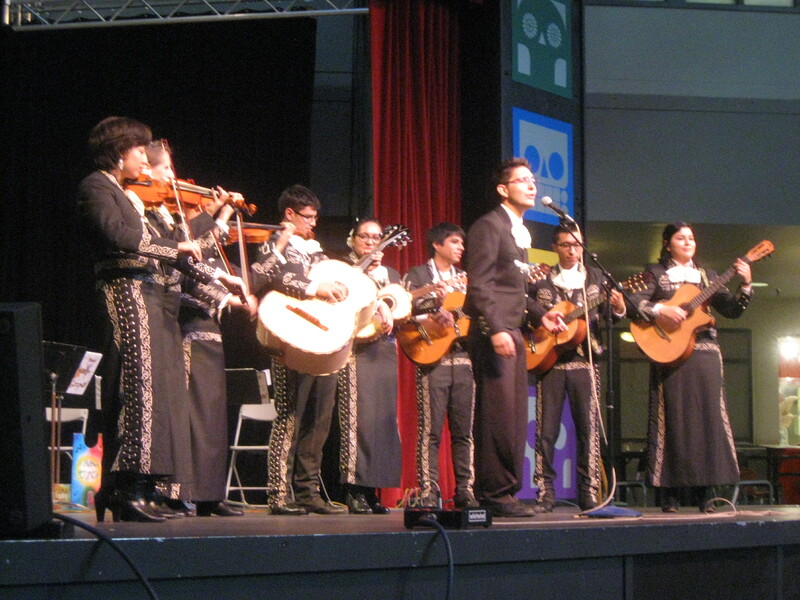 If you’ve never heard a Mariachi singer in person, let me say: they belt it out, and put every ounce of their soul into their performance. Mariachi Quinto Sol is a rather small Mariachi unit. They need some horns! If I could play one, I would offer my talents to the group. But, I’m just another guitar player. They have plenty of those! 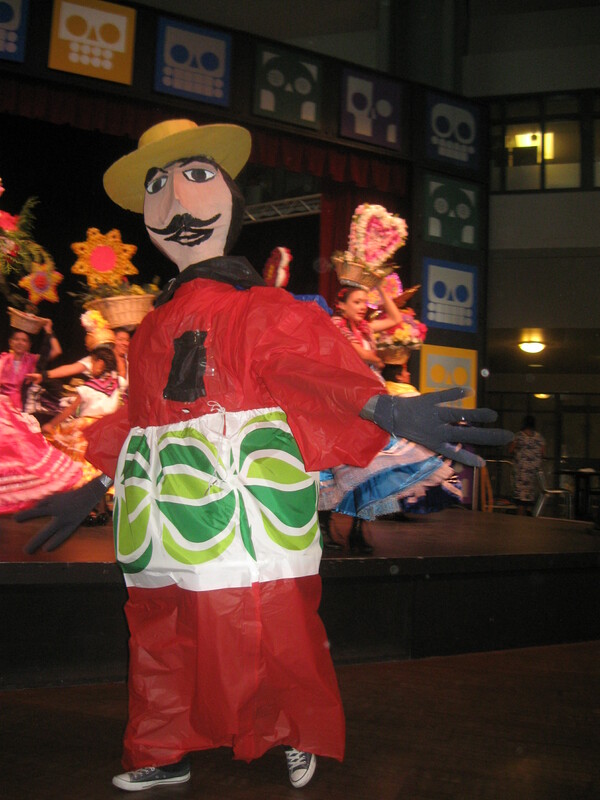 When Mariachi Quinto Sol’s spirited performance ended, this giant puppet led a procession of Oaxacan dancers to the stage. They owned the Seattle Center Armory for the next hour, as they presented an incredible, unforgettable show. They brought a phantasmagoria of brilliant color with them. 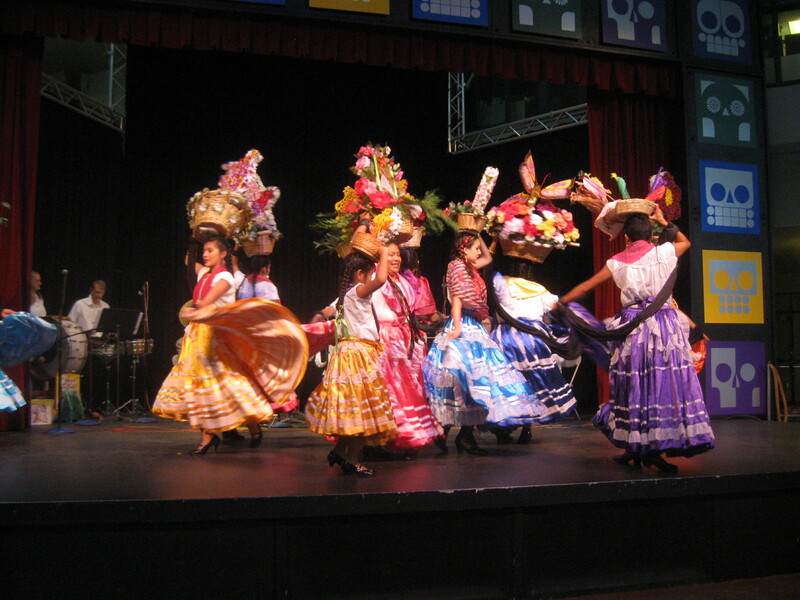 The Oaxacan women shown here, engaged in lively dance, made their headdresses, which were actually baskets. They held the baskets on top of their heads with one hand, and swirled and twirled around and around. I don’t know how they did it. And this went on for way longer than a few minutes. One more photo of the women in their wonderful apparel and headdresses. 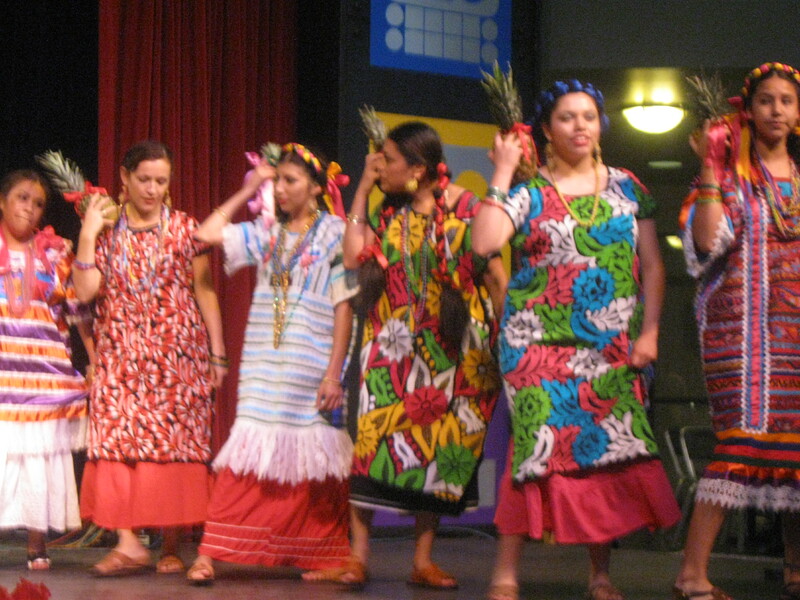 If you come to Seattle’s Northwest Regional Folklife Festival in May, and you’re fortunate, you’ll have an opportunity to see the people of Oaxaca. They’re frequent performers at the annual event. 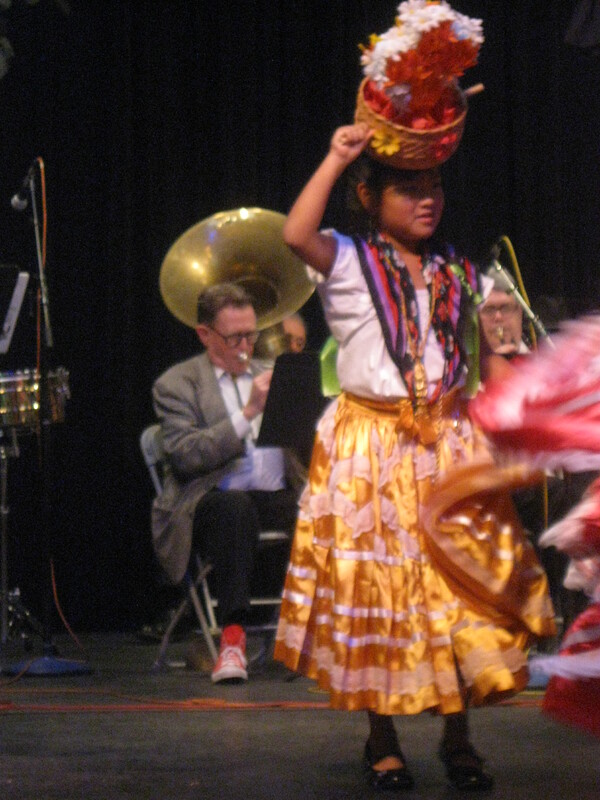 Banda Gozona’s tuba player is really pushing air through his horn as the young woman dances. He’s wearing red high-top Converse court shoes! 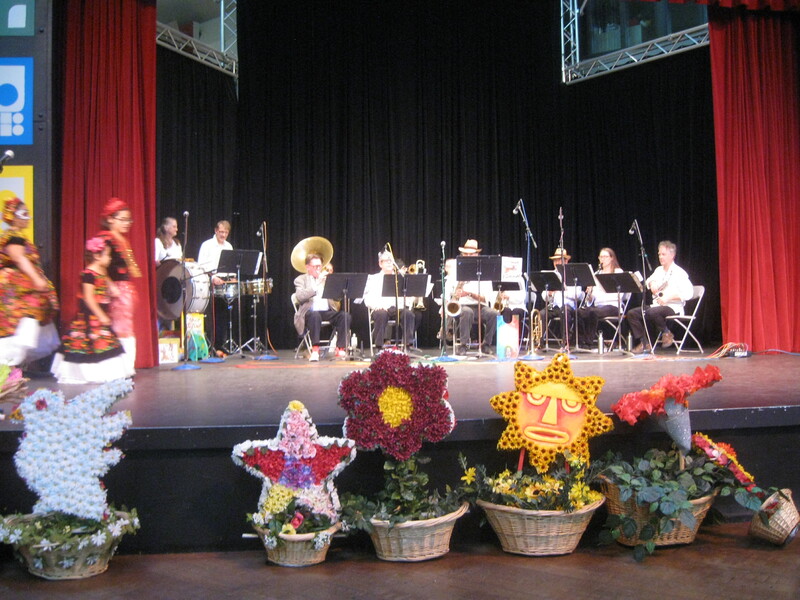 Seattle’s favorites, Banda Gozona’s members are professional musicians who donate their performance in order to provide live music for Oaxacan dance ensembles. 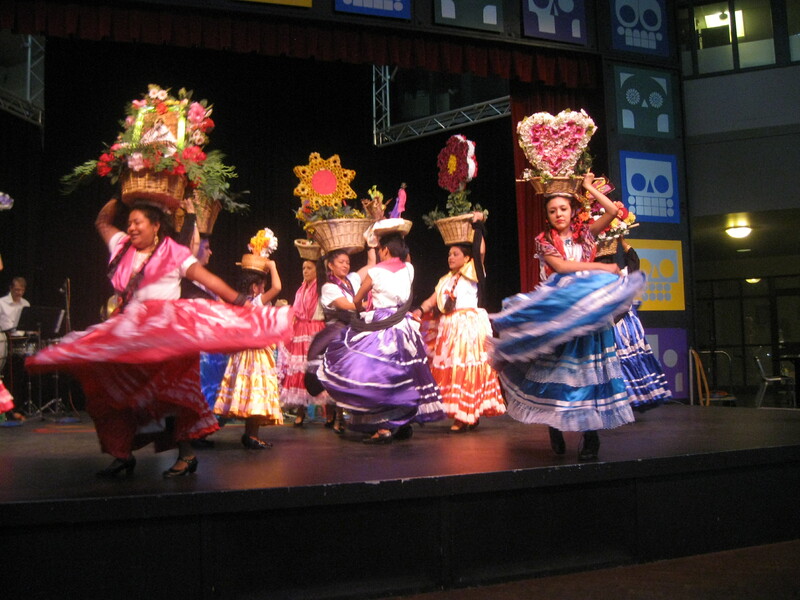 As you can see, the female dancers have removed their basket-headdresses and placed them in front of the stage. It seems that, at a Oaxacan celebration, everything is done with beauty in mind. In this light-hearted dance, the lead dancers play the part of male and female birds. 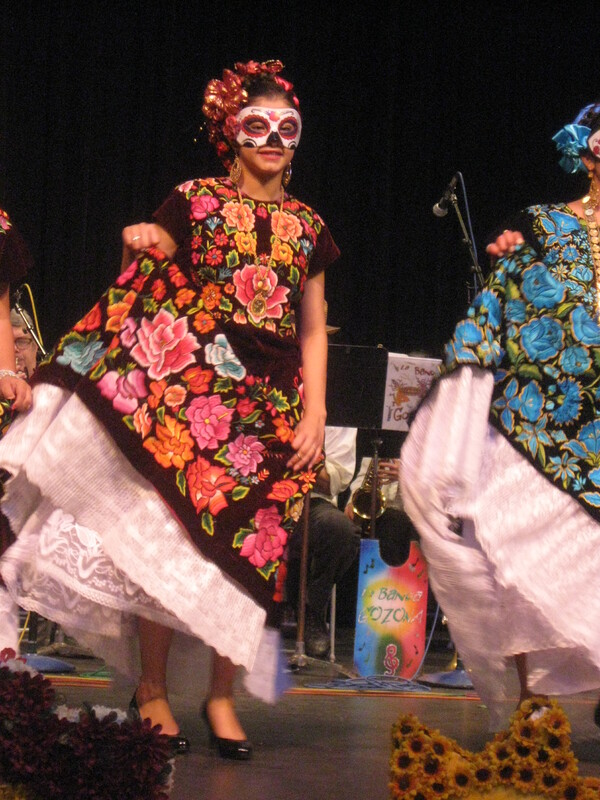 Young women wear Dia de los Muertos masks, as they hold up their hand-made skirts, and dance. These women wear satin skirts. They also wear hand-beaded collars, which, due to their intricate nature are very time-consuming to create. 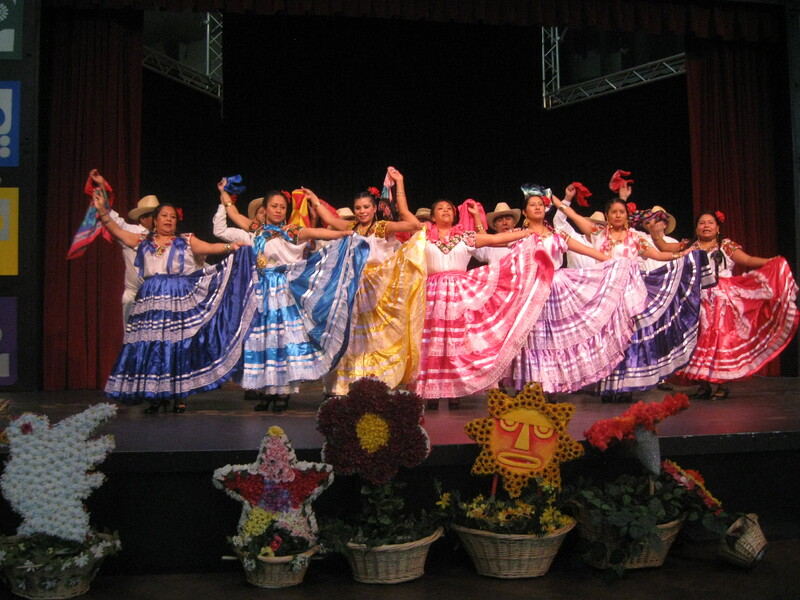 Here, senors dressed in simple clothing which pays tribute to Oaxacan agricultural tradition accompany their senoritas in a colorful dance. 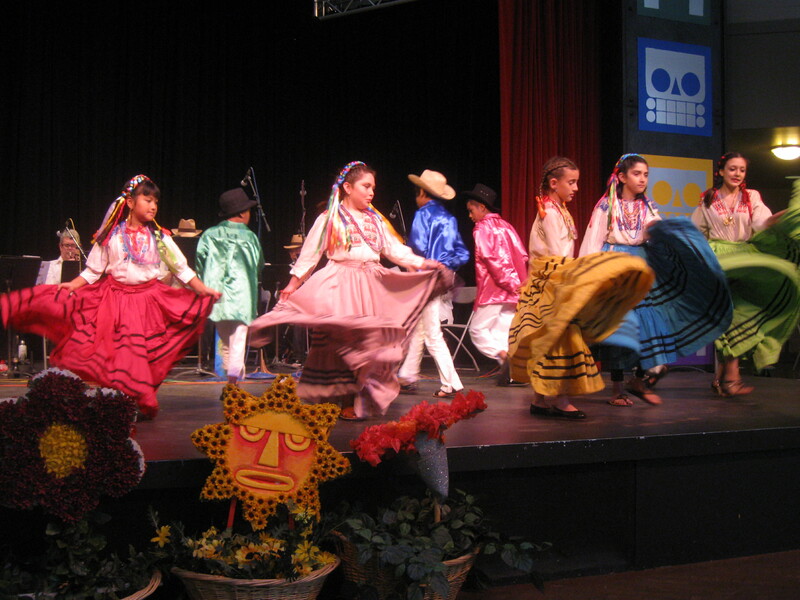 This dance showcases the children of the dance ensemble. They’re learning to embrace their culture at a young age. The program’s MC emphasized that, no matter what your language or background, it’s very important to learn your culture, and to pass it on to the next generation. 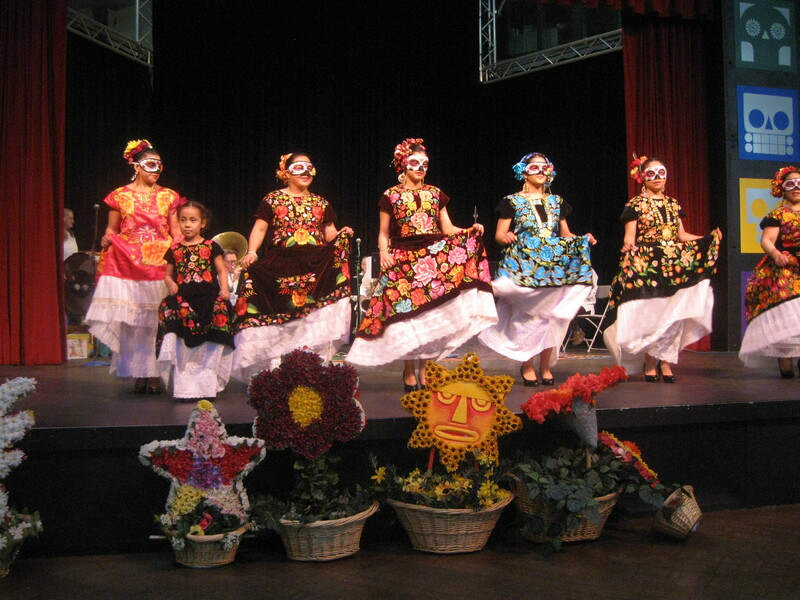 There are several regions in Oaxaca, and each has its own dance and costume. 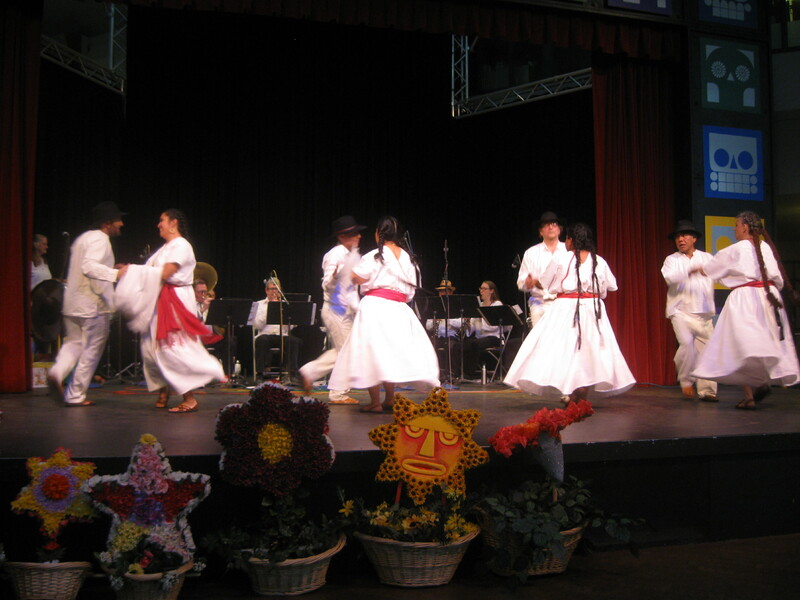 In this dance, the ensemble wears simple cotton clothing. But then, the women wear beautiful, woven red sashes, and the men were rather sporty hats. Here, nearly two dozen women dance with — pineapples. In Oaxacan tradition, pineapples represent a blessing. 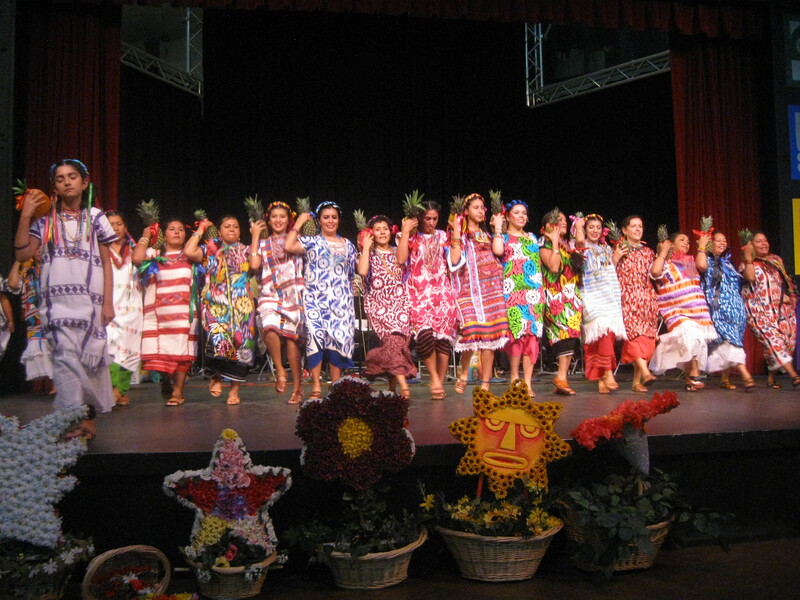 During this dance, the women held their pineapples out to the crowd, as their performance with Banda Gozona ended, in order to say “Thank you”, and “Blessings”. 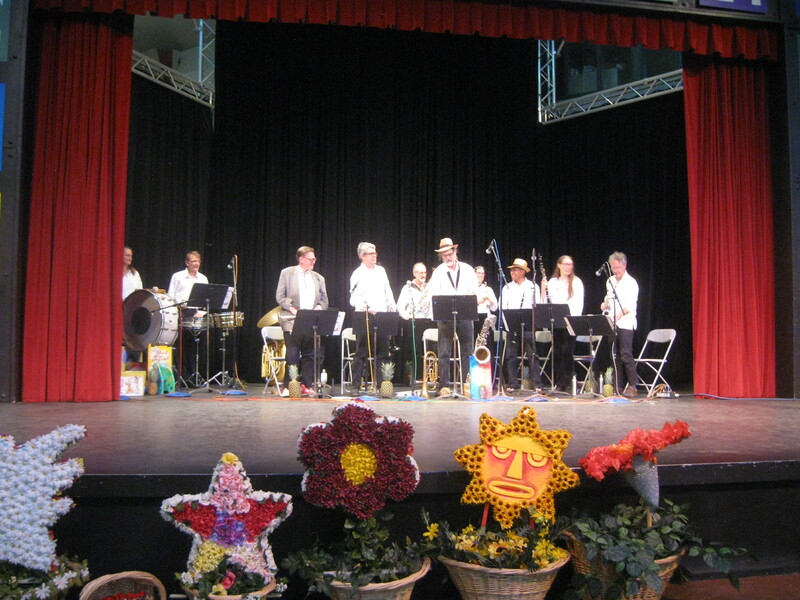 Banda Gozona members stand to take a bow as they prepare to leave the stage. The women gave them their pineapples in return for their gift of music. The Mexican state of Michoacán was also wonderfully represented today. 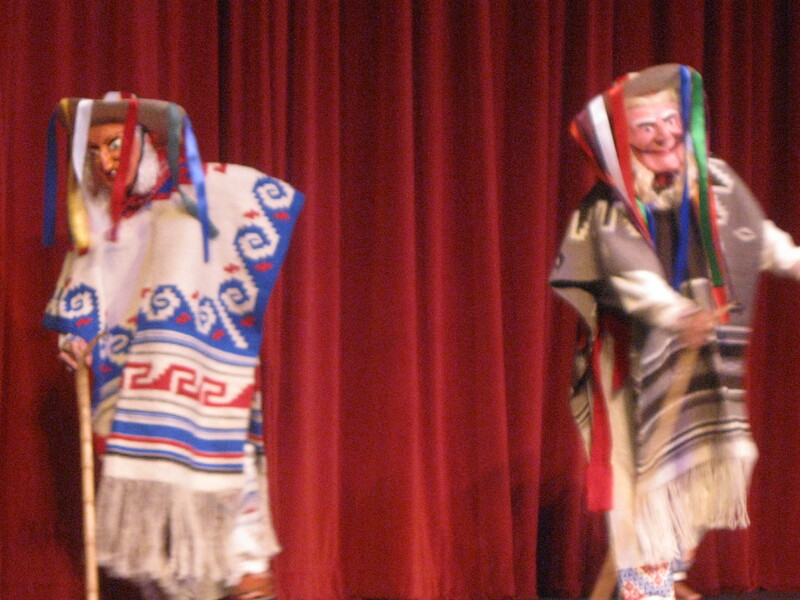 Here, four dancers dressed as spritely old men perform La Danza de los Viejitos (The Dance of the Little Old Men). 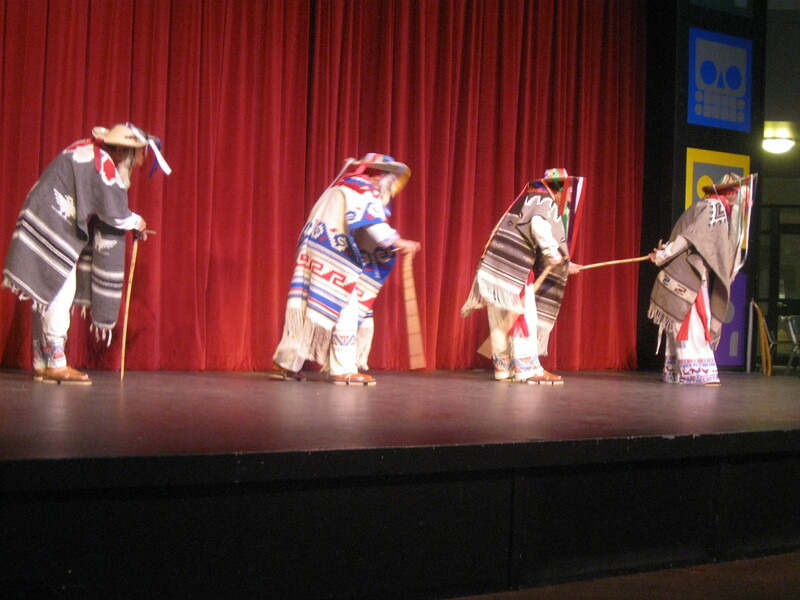 The men, wearing campesino, or peasant attire, slowly shuffled onto the stage, backs stooped, while leaning heavily on canes. Then when the music started, they danced like young men. These gentlemen were given an especially warm welcome by the audience. 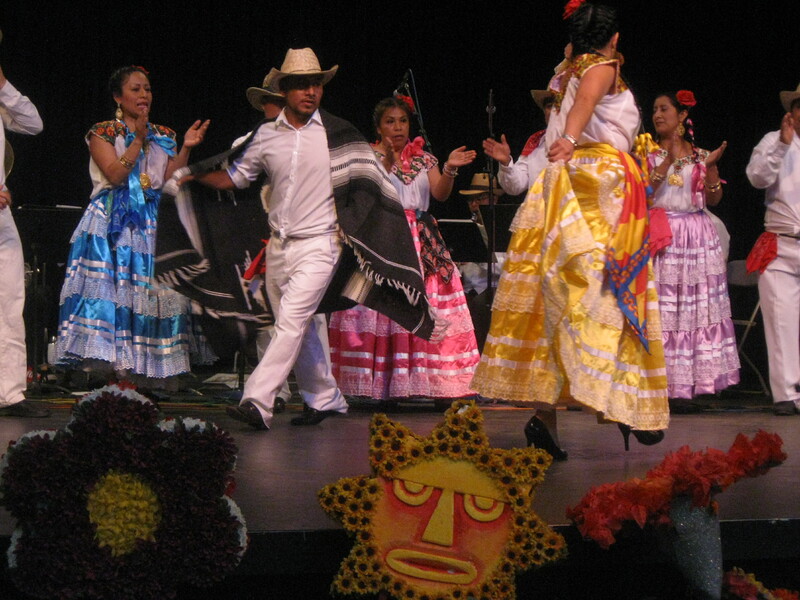 Let me add that La Danza de los Viejitos is an old dance which predates the arrival of the Spaniards to Mexico. 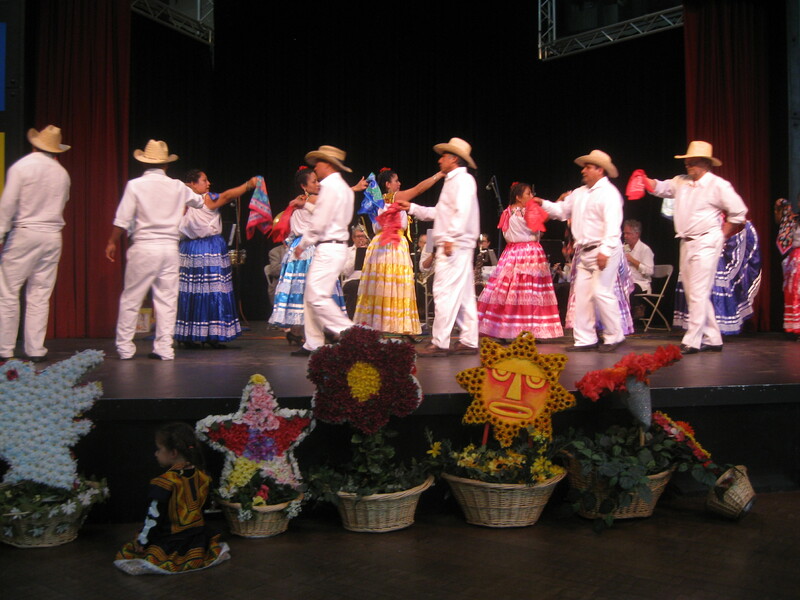 Detail of La Danza de los Viejitos. 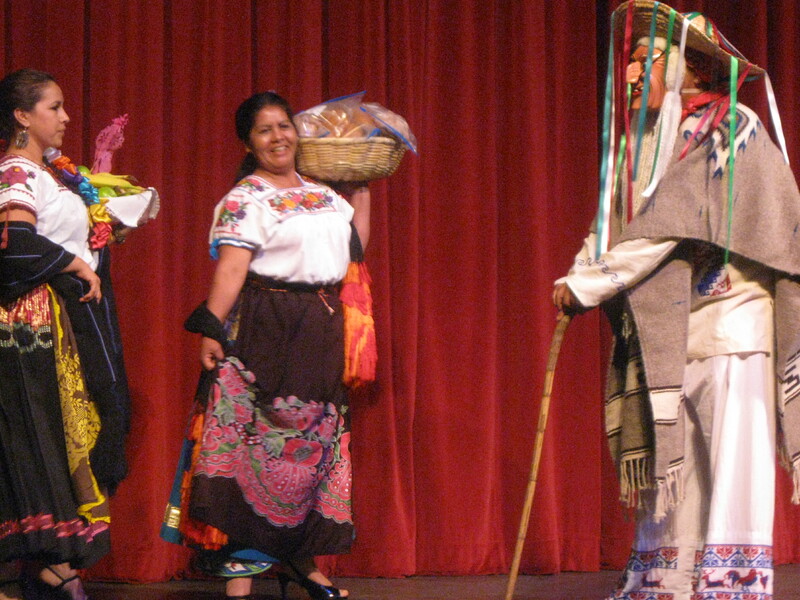 Here, one of the little old men welcomes women bearing baskets of fruit, and Day of the Dead bread onto the stage. 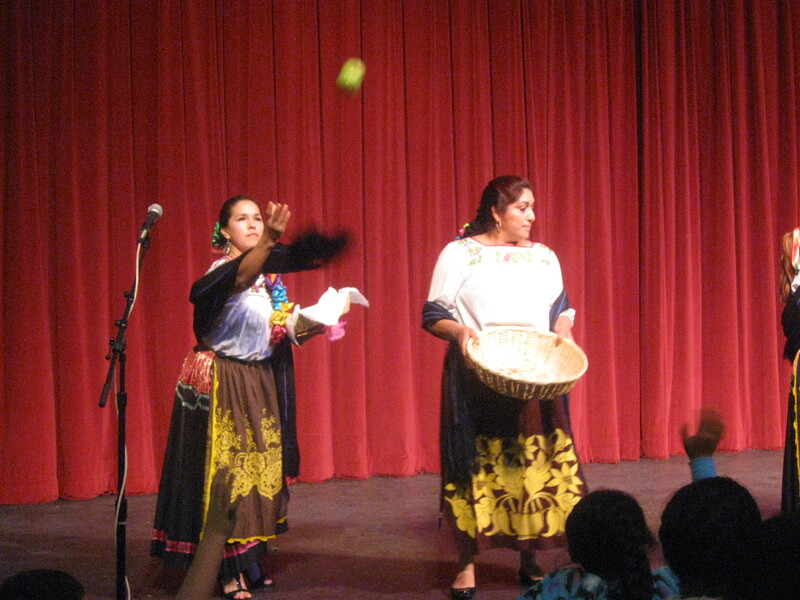 Next, the women throw the fruit and delicious bread to the audience, as a way of saying, “Thank you for coming to see us perform”. 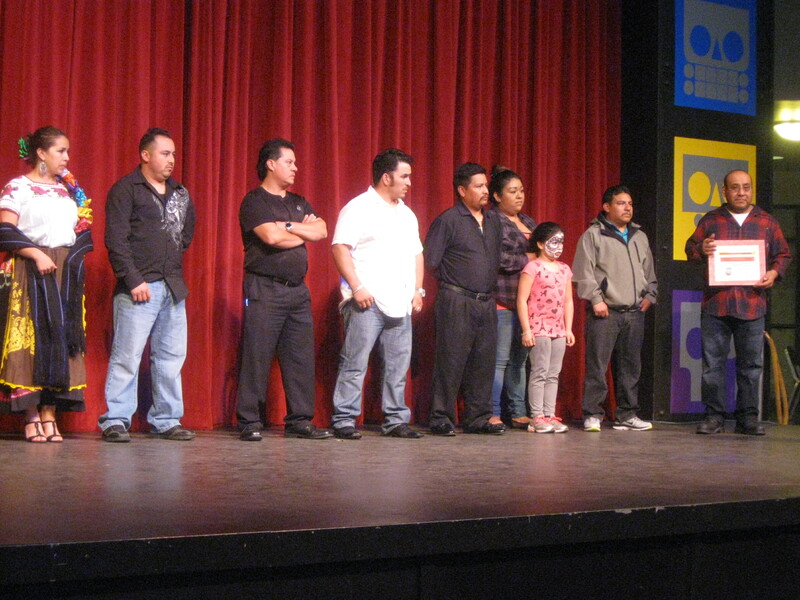 Members of the organizing committee, from Grupo Colibri, are honored for their contribution in presenting this amazing Dia de los Muertos fiesta. 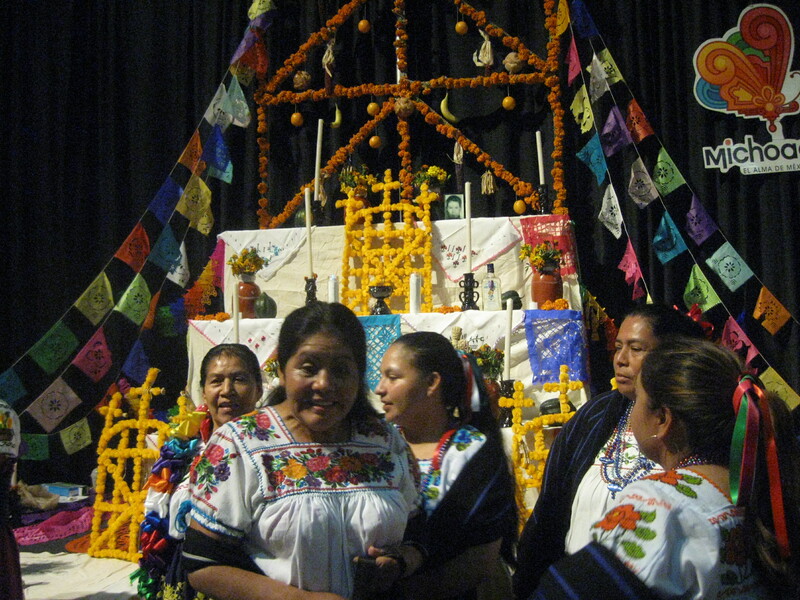 Grupo Colibri made the huge ofrenda, or altar, in the following photo. For a man who doesn’t speak Spanish, it’s surprising how much Mexican culture I’ve been able to absorb. I don’t believe in past lives; if I did, I’d have to say I once lived in Oaxaca. I hope you’ve enjoyed Day Two of Seattle Center’s Dia de los Muertos celebration, and I extend my personal invitation to you, to come in 2016. And you’d better say hello to me! Please don’t forget to read my Day One story, wherein I provide much more insight into the Mexican Day of the Dead tradition. 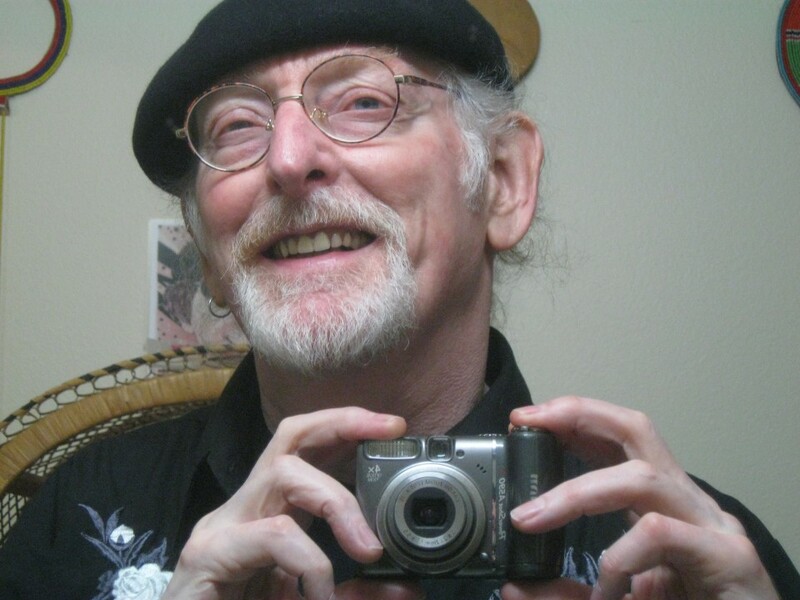 Thank you, and please comment.